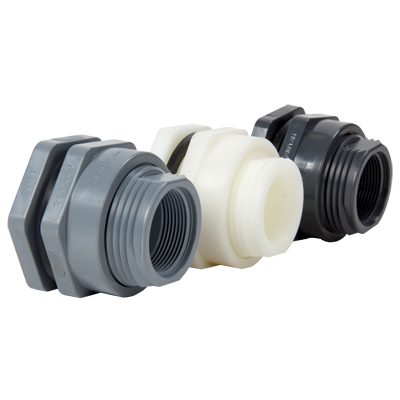 1-1/4" Installed Thread x Thread PVC Bulkhead Fitting w/EPDM Gasket - Hole Size 2.63" Hole Size | U.S. Plastic Corp. This installed 1-1/4" PVC Bulkhead Fitting has an outside dimension of 3.25" across flats and overall length of 3.00". Maximum tank wall thickness is 1.00". Minimum flexible tank radius is 12.19" and minimum rigid tank radius 16.25". Hole size required is 2.63".